These examples show the flexibility of renting boiler equipment instead of buying. To support plant expansion, Central Valley Meats, a large meat supplier, needed to replace their existing boiler system. Our SCB-56 Superior Mohawk 450 HP Trailer unit successfully provided the plant with the interim support necessary to run business operations reliably and efficiently throughout the new boiler system installation. University of California in San Diego required auxiliary support for six months to heat and provide hot water to the dormitories on campus during a recent renovation. Since the onset of the project, our SCB-92 Hurst Series 400 150 HP trailer unit has easily maintained dorm operations without incurring any down time. 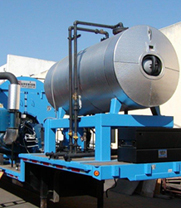 In order to effectively heat and transport products from railroad cars, a local material transfer company needs a flexible boiler system that can adapt to the unique nature of their business. The facility rents 7 or more trailer units at any given time, employing many different boiler sizes ranging from our new 119 HP Hurst series 250 boiler trailer unit to our small 50 HP series 250 skid mounted boilers.